Women already have a strong impact on the social and economic life in Africa. Yet currently their influence is often still limited to small businesses on a local scale. Better education, an enabling environment and access to digital tools should increasingly enable them to engage in high-tech start-ups. Pioneers – like Vivian Nwakah with her company MedSaf based on cutting-edge blockchain technology – are paving the way for the next generation of African women entrepreneurs. First initiatives – such as the Women's Technology Empowerment Center in Nigeria– encourage women to use technology to promote entrepreneurship in Africa. 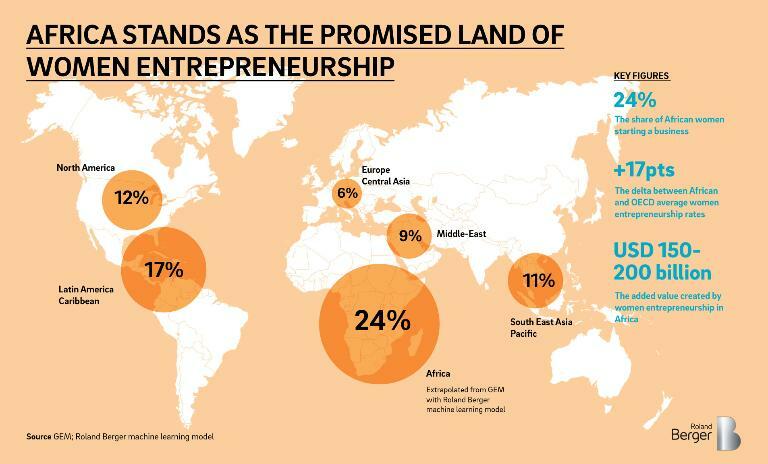 The share of African women starting their own business is surprisingly high. The TEA rate – which is defined as the rate of working age women running a start-up that was founded up to 42 months ago – has hit 24%. As the study shows, that rate is particularly high compared to other regions such as Latin America Caribbean (17%), North America (12%), Middle-East (9%), South East Asia Pacific (11%) and Europe / Central Asia (6%). 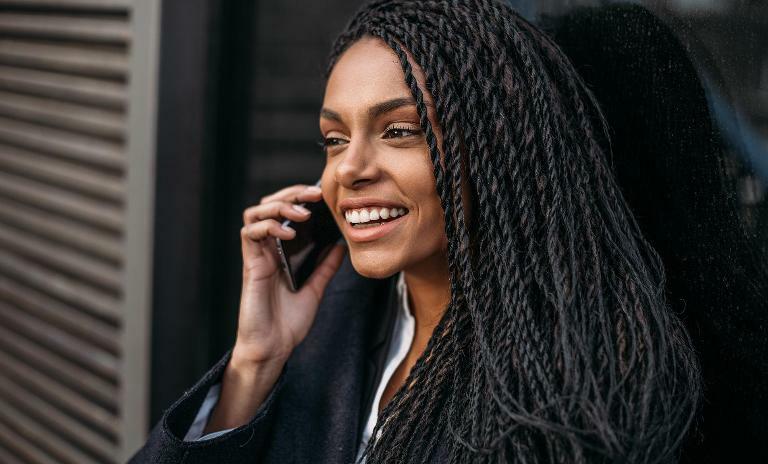 And the positive development continues: about one in two African women plans to engage in entrepreneurial activity within the next three years. Socio-demographic data on female entrepreneurs in Africa is becoming increasingly available. For this study, Roland Berger analyzed figures from 19 countries from 2012 to 2017 and relied on a machine learning model including algorithms on education, the conditions for starting a business and the fertility rate. As a result the countries were sorted in four categories: "The Struggling" (Ethopia, Mali, etc. ), "The Striving" (Kenya, Tanzania, etc. ), "The Emergent" (Nigeria, South Africa, etc.) and "The Traditional" (Algeria, Egypt, etc.). Female entrepreneurs contributed between USD 250 billion and USD 300 billion to African economic growth in 2016, which is equivalent to about 13% of the continent's GDP. Yet "The Emergent" contributes by far the highest amount (62%), while "The Traditional" is little more than zero. "I feel like people see entrepreneurship in Africa as a path to being able to own a bit more of their destiny." The analysis leads to two seemingly paradoxical statements. First: education is crucial. 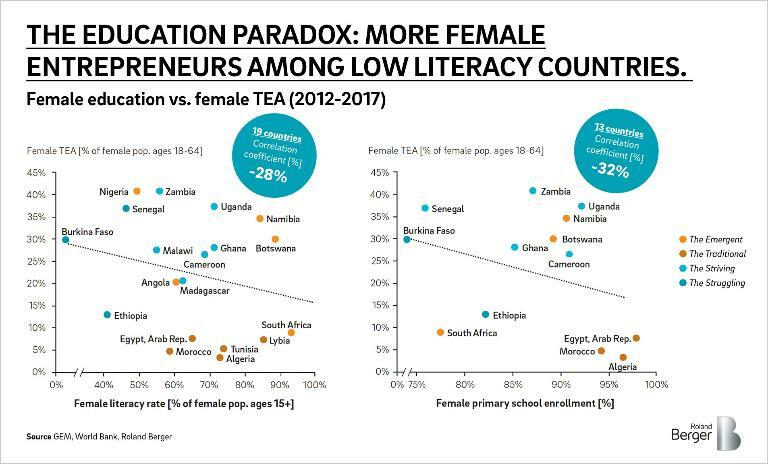 Women tend to be more entrepreneurial if literacy and school enrollment rates are lower, since their lack of education is an obstacle to finding a job. Second: children do not decrease women's employment or entrepreneurship. The African woman entrepreneur is most often the mother of several children: she needs to take care of the whole family. But external factors – such as lack of access to skills funding, networks and role models – often impede the growth and development of the business. In Africa, women entrepreneurs are mainly active in sectors such as agriculture, energy (for examle, projects to improve local electrification or access to water), education and health. In Western countries, start-ups focus more on digital tools, high-tech and disruptive technologies. However, African women demonstrate creativity by setting up their own job – and by bringing solutions to unaddressed issues in their environments. Looking ahead, Africa's educational system needs to be strengthened – including basic education and continuous training. Women need to be enabled to choose paths in various fields such as science, technology and business, to expand into the digital sector, and eventually move beyond the local scale. A role model for the upcoming generation of female entrepreneurs could be Vivian Nwakah. Her company MedSaf offers a medication supply chain management solution for hospitals and pharmacies based on blockchain technology. It's likely there will be many more entrepreneurs like her in the future. 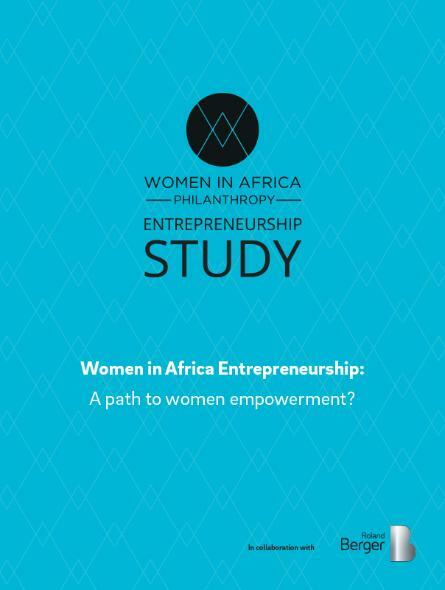 "Women in Africa Entrepreneurship" – a cooperation between Roland Berger and Women in Africa Philanthropy – offers insights on the profile of female entrepreneurs in Africa.